The sound of the producers Stock, Aitken & Waterman is instantly recognisable. In the second half of the Eighties, they defined chart pop. 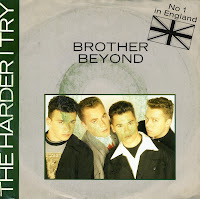 The group Brother Beyond formed in 1987 but released four singles before they ended up with the producers trio. But when they did, it was an instant success: whereas previous singles didn't make the UK top 40 (but ended up somewhere between number 50 and 75), 'The harder I try', released in 1988, peaked at number 2, held off the top spot by Phil Collins' 'A groovy kind of love'. The single even was their only release to make the Dutch Top 40, peaking at number 18. It was the biggest success for the band, which consisted of Eg White, Nathan Moore, David Ben White, Carl Fysh and Steve Alexander.